Tastes thick and robust. Tea connoisseurs appreciate Chinese Black tea as a beverage with various purifying qualities. Chinese Black tea blends easily with other flavors to create a rich and exquisite taste. Regular consumption of Chinese Black tea can reduce risk of stroke. Ying De Hong is one of the very few Black teas to come from the Guangdong province of China. 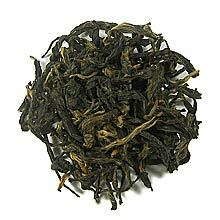 Also known as Guangdong Black and Ying Hong, this Black tea was first introduced in the year 1959. This tea has a peppery note and a sweet finish. Blends well with condensed milk. Dark, slightly curled golden brown tea leaves. The infusion produces cups of bright amber-colored beverage.